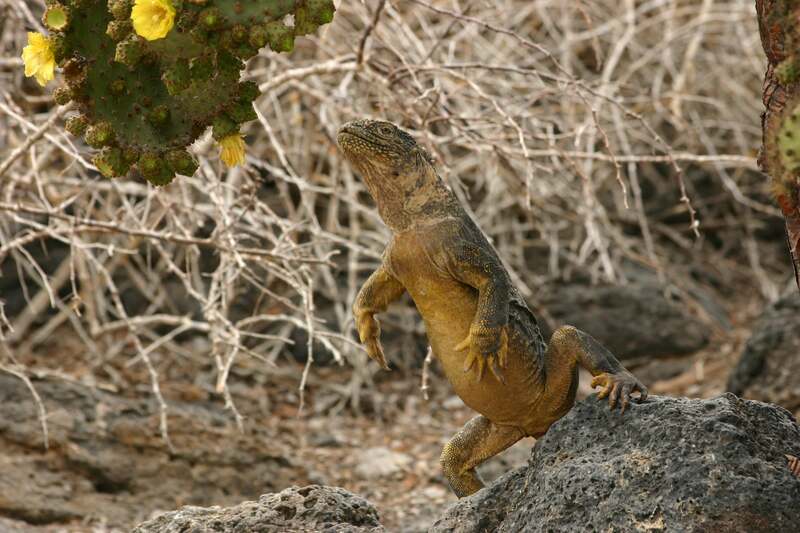 One of three species of land iguana found in Galapagos, this large, yellow lizard inhabits the arid zone of a number of the islands. 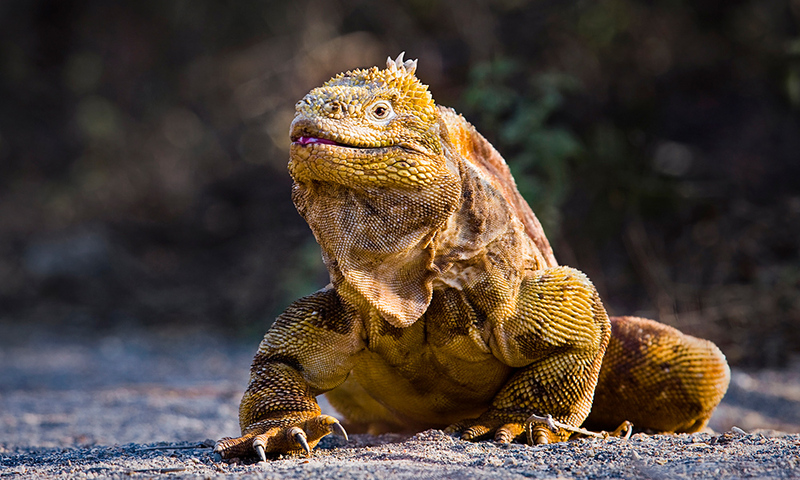 The Galapagos land iguana is one of three species of land iguana endemic to the Galapagos Islands (the others being the Santa Fé land iguana and the pink Galapagos land iguana). Their skin is generally yellow with white, black and brown blotches. They have a short head and powerful hind legs with sharp claws on their toes, but despite their intimidating appearance they are primarily herbivores – feeding on prickly pear leaves and fruit. These large cold-blooded reptiles have a mutualistic relationship with finches – which can often be seen sitting on their backs, picking ticks from between their scales. The population of land iguanas has undergone a severe decline over the last 150 years and, until 2019, were locally extinct on Santiago island. Female land iguanas have been known to travel great distances to find the ideal nesting place. Once she has found a satisfactory site, the female buries her clutch of approximately 20 eggs. She then guards her eggs, protecting them from other females which may dig them up when looking for a place to bury their own eggs. Males will also guard the territory – bobbing their heads, thrashing their tails and biting at any opponent who strays into the vicinity. The eggs hatch after 85 to 110 days, but it may take the hatchlings up to a week to dig themselves out of their nest. Young iguanas are very vulnerable to predation for the first few years of their life, however the risk of predation decreases as they grow larger. They generally reach maturity between eight and 15 years of age and can live up to 50 years. Where to see them: Fernandina, Isabela, Santa Cruz, South Plaza, Baltra, Santiago and North Seymour islands. When to see them: They can be seen all year around. 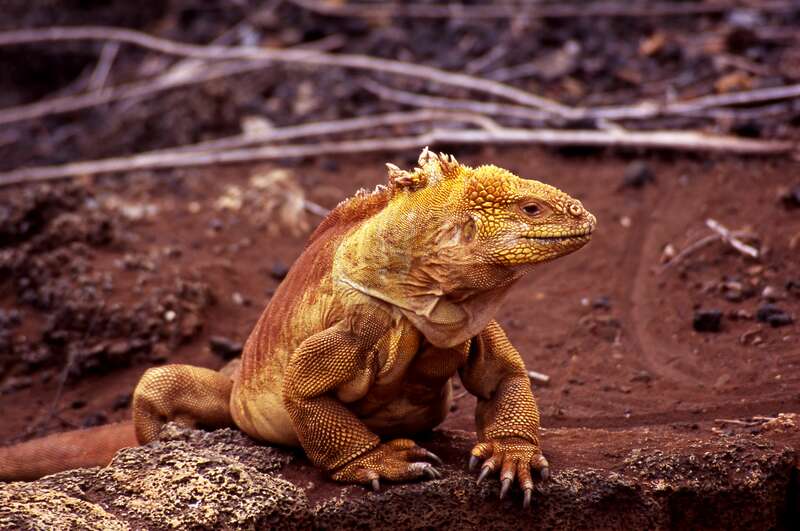 Threats: Introduced animals such as cats, dogs, pigs and rats cause decreases in land iguana populations due to competition for food and predation of eggs and juveniles. Whereas natural predators tend only to hunt iguanas under a year old (when they become too big to eat), cats have been shown to predate three or even four year old iguanas. Conservation actions: Feral dogs wiped out the last colonies of land iguanas on Santa Cruz in 1976, and the remaining 60 survivors were rescued by the Charles Darwin Research Station. A similar population crash on Isabela prompted a captive breeding program to be set up on Santa Cruz, which still continues today. 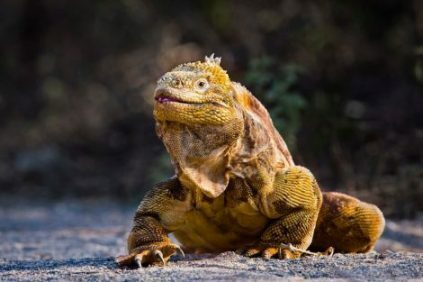 In 2019, over 1000 Galapagos land iguanas were reintroduced to Santiago island by to boost the survival of Galapagos land iguanas, but also to help restore Santiago’s ecological health. This was part of a project that we support. 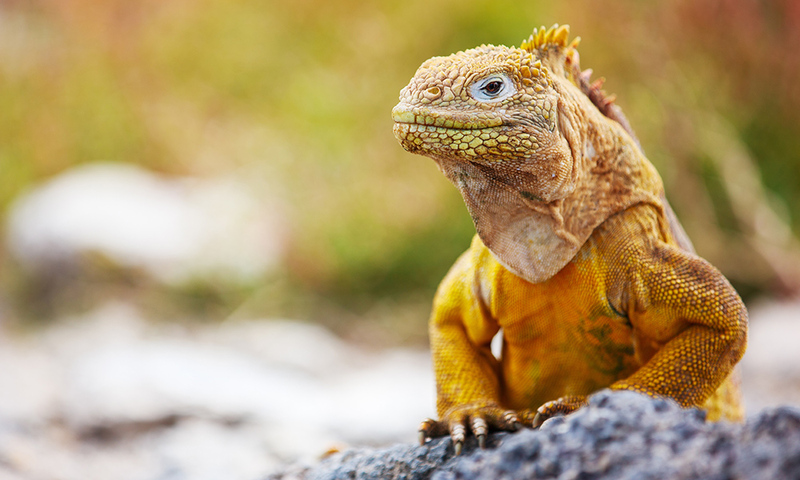 Help us to protect Galapagos land iguanas by donating today! 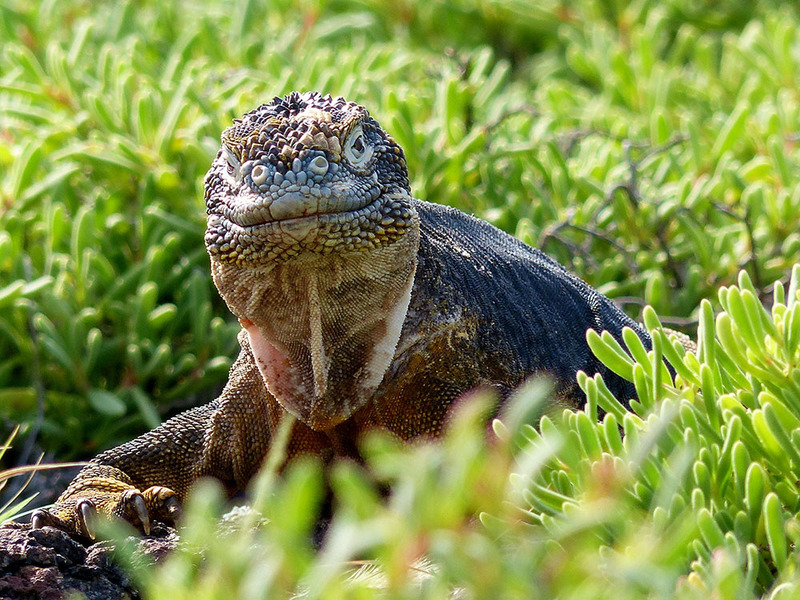 Find out about our Galapagos land iguana project, which is working to project the species.